On June 30, India celebrated another successful launch of the Polar Satellite Launch Vehicle (PSLV), the workhorse of the Indian Space Research Organization (ISRO). This time, India’s Prime Minister Narendra Modi was in attendance. His SHAR speech emphasized the role of technology in aiding development and referenced the humble beginnings of the ISRO. Among the many points he made, two were geopolitically significant. First, he observed that the satellite being launched, SPOT 7, belonged to a developed nation: France. Second, he challenged the ISRO to develop a satellite that would serve the South Asian Association for Regional Cooperation nations. Those thoughts coincide with two of the three major foreign policy issues that confront India, as noted by Shivsankar Menon: its relations with major powers and its need for a peaceful and prosperous neighborhood. Cooperation with France in space launches and spacecraft construction represents an improvement in bilateral relations. Contested during the Cold War, the global commons is now increasingly a platform for cooperation, a reflection of the success of the policy of détente. A partnership that began with the Apollo-Soyuz Test Project (ASTP) ultimately evolved into one of the largest international cooperative projects, the International Space Station (ISS). An “Agreement on Cooperation in Science and Technology,” which included space technology, is one of the foremost partnerships the U.S. established immediately after its historic diplomatic recognition of the People’s Republic of China. The cooperation and collaboration that India has enjoyed with France has been matched perhaps only by its work with Russia. ISRO acquired the use of French launch complexes, received technical assistance in the construction of the SHAR launch complex, and executed contracts with the French Arianespace launchers. This provided the impetus for the 2008 Indo-French framework on joint space missions. The development of Megha-Tropiques, launched in 2011, and the satellite with ARgos and ALtika (SARAL) in 2013 are the results of that framework. 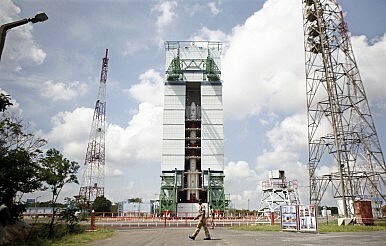 While the Ariane launchers have placed into orbit 14 geo-stationary satellites for India, starting with the first communication satellite APPLE, a commercial agreement between Antrix Corporation Limited (Antrix) and Astrium SAS allowed PSLV to reciprocate by launching the SPOT-6 satellite, in addition to Megha-Tropiques and SARAL. This long-term relationship has helped India expand its presence into other European countries, including Germany, which flew nine satellites and an instrument onboard Chandrayaan-1, Denmark, Switzerland, Austria, and a number of other countries. The latest launch coincided with the arrival of French Foreign Minister Laurent Fabius in India to extradite the Rafale fighter jet deal and others, further strengthening the relationship. India has been able to maintain its independence by balancing relations with Russia in this arena with France. Meanwhile, the ISRO was able to overcome U.S. controls on the export of defense and aerospace technology by establishing an indigenous base for satellite manufacturing and developing launch vehicles. These in turn helped to preserve India’s strategic autonomy. As such, ISRO programs remained largely civilian in nature. The INSAT program providing telecommunications, cyclone warning & rainfall estimates, and search & rescue services is one of the largest domestic communication satellite systems of the Asia-Pacific region. In addition, its remote sensing satellite system providing applications in areas such as agriculture, water resources, urban development, mineral prospecting, forestry, and ocean resources has become the largest civilian remote sensing constellation in the world. The EDUSAT program connected about 56,164 schools and colleges in 26 states and three Union Territories and had a dedicated satellite GSAT-3 for that purpose. India also hosts the Centre for Space Science and Technology Education in Asia and the Pacific (CSSTE-AP). The ISRO Telemetry, Tracking and Command Network (ISTRAC) operates three international stations in Brunei, Indonesia and Mauritius. The ISRO also established the India-Myanmar Friendship Centre for Remote Sensing in 2001. The heads of ASEAN space agencies met with ISRO officials in June 2012 seeking India’s assistance in developing their own programs. Agreements or memorandums of agreement were also signed with Indonesia in 2002, Mongolia in 2004, Kazakhstan in 2007, among other countries. These represent tremendous potential for space revenue as well as the possibility of establishing strategic partnerships. However, as India’s Research & Analysis Wing documents make clear, India’s indifference towards its neighbors had indirectly helped China to capitalize on the situation. Meanwhile, China along with Pakistan, Bangladesh and a number of other countries have set up a regional partnership organization called the Asia-Pacific Space Cooperation Organization, with projects that include sharing data, establishing a space communication network, and tracking space objects. China is helping set up a space academy/satellite ground station alongside the launch of a telecommunications satellite in 2015 for Sri Lankan firm Supreme SAT Pvt. Ltd., and signed an agreement with the Board of Investment of Sri Lanka for the purpose. Bangladesh and Maldives were also expected to pursue a similar path. Meanwhile, Pakistan is expected to receive military grade positioning and navigation signals from China’s BeiDou system. These developments have shocked the Indian establishment, but still New Delhi has yet to sign a memorandum of understanding or agreement with any of the other SAARC members. With the support of the new Modi government, ISRO is expected to reverse the trend and be proactive in space diplomacy. Therefore, the remarks of Narendra Modi do not merely represent a developmental initiative for creating a digital India; they are a signal to enhance national security through neighborhood development and create an incentive to establish a robust foreign policy after the many misadventures seen during the tenure of the previous government. Vidya Sagar Reddy Avuthu is a postgraduate student in Geopolitics & International Relations at Manipal University, India.